Everybody is Asking; Where’s The Snow? I’ve heard this comment a lot from a few folks and in the nicest way possible I say, “that’s absolutely wrong.” There is nothing surprising about Castle Rock, the Palmer Divide, the mountains or even most of the state of Colorado being in drought status in early January during a La Nina year. If you’ve followed along with us for some time, you noticed how much we talked about La Nina through the late summer and fall months. We even expressed concerns about windy, dry and warm days as early as October. If you follow other meteorologists, you’ve heard them say the same things. The fact is while no two La Ninas are exactly the same, there are some larger scale patterns and trends that take place during these types of years. 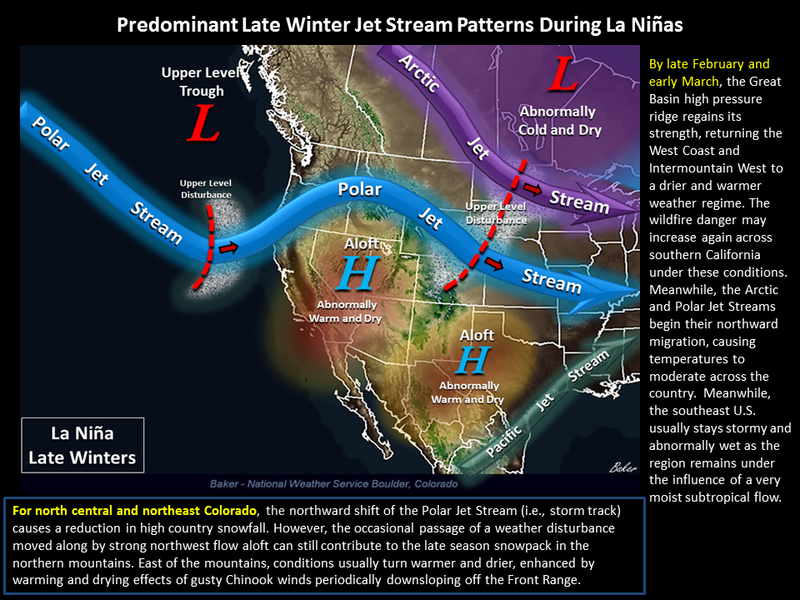 The National Weather Service in Boulder put together some great graphics that explain what type of patterns we typically see with La Ninas in the Western United States. If you look closely, you’ll notice that we have seen these patterns largely verify for Colorado’s weather so far this year! 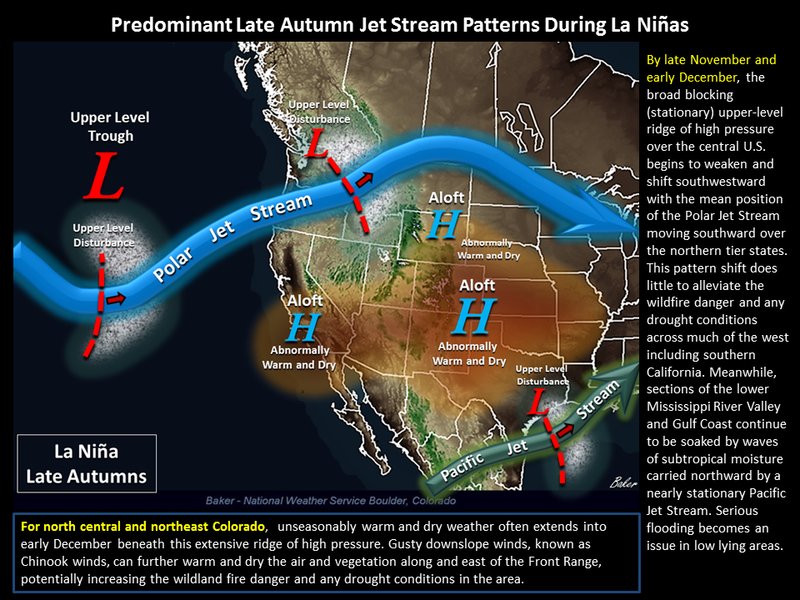 In fall Colorado tends to see much warmer than average temperatures and very little moisture as the jet stream stays North of the state and tends to steer storms systems away. High pressure aloft keeps the air very dry and warm with windy conditions. This is nearly exact to what we saw this fall. Check out our November climate summary to find out just how warm and dry we were! You’ll notice September and October were both warmer and drier than average as well. Below is the pattern we expect to see right about now. By the time we reached late December we began to see more swings between warm sunny days with occasional cold fronts moving through to drop the temperatures. Pretty spot on to what we’d expect except the mountains remained relatively dry along with the Eastern plains of Colorado. Extremely cold air affects the Northeastern United States as we’ve seen has been the case so far this year. 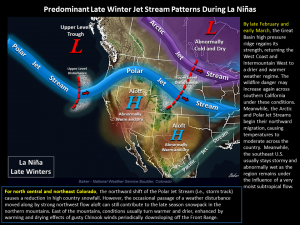 As we transition into the late winter months the jet stream continues to shift with the arctic jet moving Northward and the Polar jet having a pronounced high pressure ridge over the Southwestern United States. This pattern can be similar to fall so it’s worth keeping an eye on, we should probably expect more dry and windy days ahead for areas East of the Continental Divide. 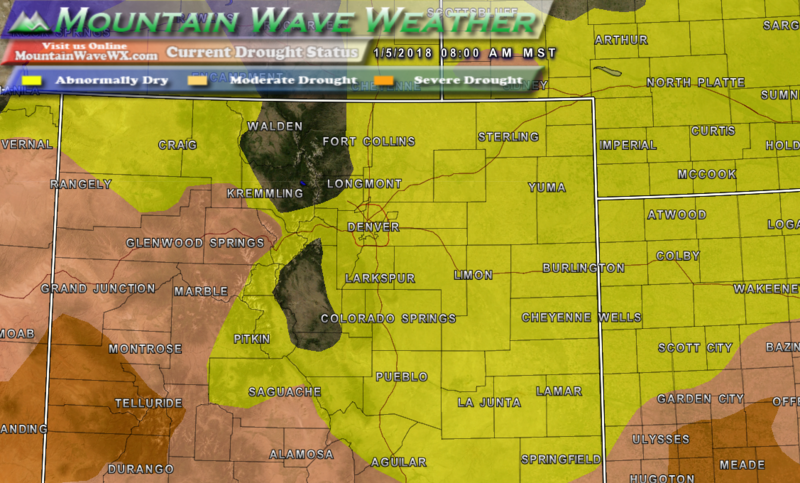 While the mountains have been quite dry so far, there is no reason to think they will continue to be for right now. As the jet starts to shift, unsettled weather will become more common for the mountains, but it’s a matter of how much shifting goes on and does it set up well for the mountains to benefit? Sadly, I expect areas East of the Continental Divide to finish below average on snowfall. Not to say there’s no chance of a big storm, but our snowfall numbers are dwindling to the point where we’d have to get multiple large storms to break even. 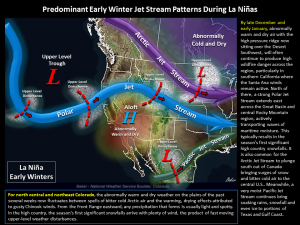 A large storm or two is possible during a La Nina year, but more than one is pretty unlikely. Watch For: If we get any consistent snowfall along the front range, it will most likely be after mid/late February. I am getting a tad concerned about overall snowpack in the mountains but am not ready to panic yet. With this type of weather pattern, all it takes is a tiny shift to line up several storm with heavy snow that can bounce back the snowpack. The problem is, these snowstorms will favor Northern mountain areas the most (think Steamboat, Winter Park and the such) while the Southern mountains have a harder time getting snowfall. Watch For: Northern mountains have a better chance for a rebound in the next month or two, keep an eye out for a jet stream shift and weather disturbances moving in from the Northwest. Southern mountains may have a tough time reaching the same snowpack numbers due to the Northwesterly component of storms. It has indeed been dry and it looks like areas East of the Divide will remain warm, dry and windy through most of January with only small storms coming through to drop the temperature and maybe sprinkle a few snow flurries. We will keep an eye out for a pattern shift as we move into Spring, that will be the best chance to see larger snowfall for us along the Palmer Divide, but there is no guarantee we will see a large snowstorm this year. For the mountains; don’t count them out yet. There are indications their weather pattern will get more active in the next few weeks, the key here will be how long that pattern stays active. If we don’t see a series of larger storms moving through by mid-March it will be time to get worried.